Looks like Akai has decided to free the MPC software from requiring an MPC hardware controller for it to work. 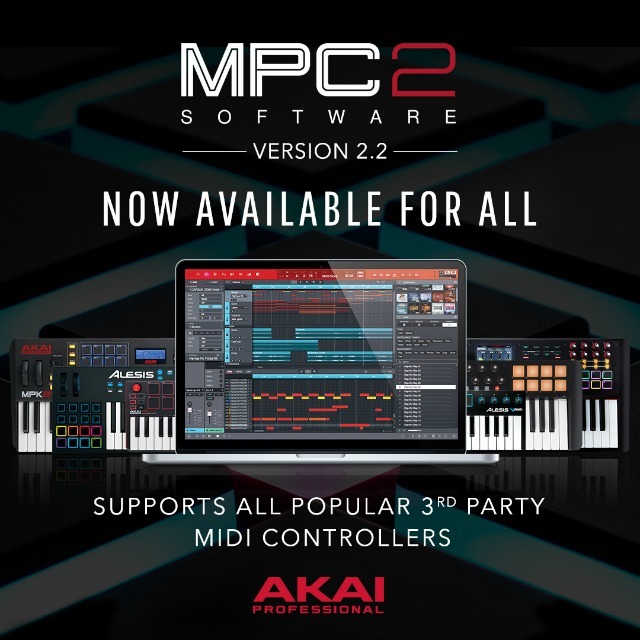 The world’s most influential manufacturer of music production gear, AKAI Professional and Plugivery, a leading distributor of audio plug-ins and sample based instruments, today proudly announce the launch of the MPC 2.2 software which is a REVOLUTION for the creative audio production community. Until today, AKAI’s acclaimed MPC software for Mac & PC was ONLY available to users that own MPC hardware. But, with this long-awaited update, owners of other branded controllers such as M-Audio, Native Instruments, Alesis, Novation, etc. can fully control the MPC 2 Software. MIDI Learn (Global): MPC Software can now be controlled by external MIDI surfaces other than the MPC, such as keyboards and pad controllers. This includes 3rd-party products. MIDI Learn (Project): Automat-able parameters (volume, pan, etc.) can now be controlled by external surfaces such as the faders on a MIDI mixer or rotary knobs on keyboard controllers. Generate Random Events: MPC can generate random melodic and drum patterns across the timeline. Many more workflow and stability enhancements. Interesting, generous, thoughtful move from Akai.